I hope you are hungry and you want a healthy stuffed pepper because I have a treat for you. These are so good my kids ask me to make them. I know it is hard to believe but when you make them not only will you look like a gourmet cook but you will fall in love with stuffed peppers. It gets even better not only can you make stuffed pepper in your oven. I will tell you how to make stuffed peppers in the Pressure Cooker. 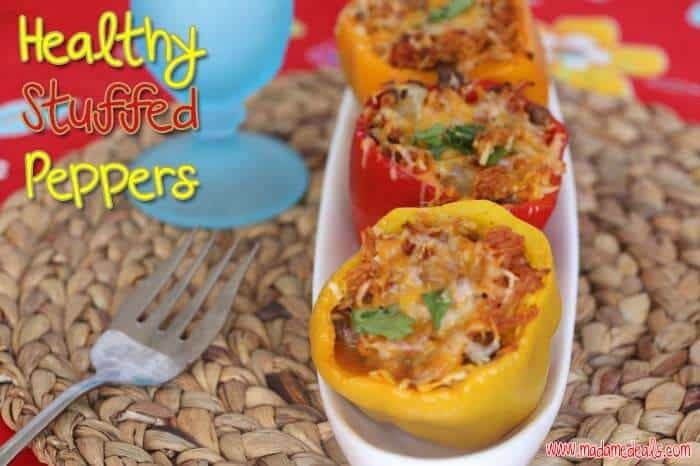 These healthy stuffed peppers make a great quick dinner or a Freezer meal in a jiffy. I loved that I was able to use Jimmy Deans Sausage Crumbles. They really sped up my prep time and increased the flavor factor to an out of control “YUM!” Jimmy Dean was kind enough to send me free products coupons which were a good thing because I made several batches to freeze for those nights when I want something healthy and hearty but I do not want to actually “cook”. I am a pop it in the oven kind of gal. These also look amazing when you have a party and serve them. 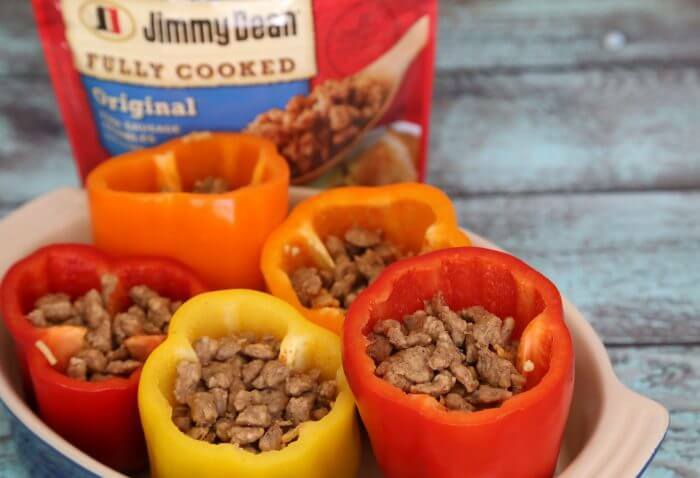 I am spoiling my secret sharing how easy they are to make especially since Jimmy Dean cooked the meat and that is usually the hardest and most time-consuming part. You will need the following ingredients for your very own quick, healthy, and easy to prepare meals. Yes, you can freeze this just put it together and do not cook it until you are ready to eat it. 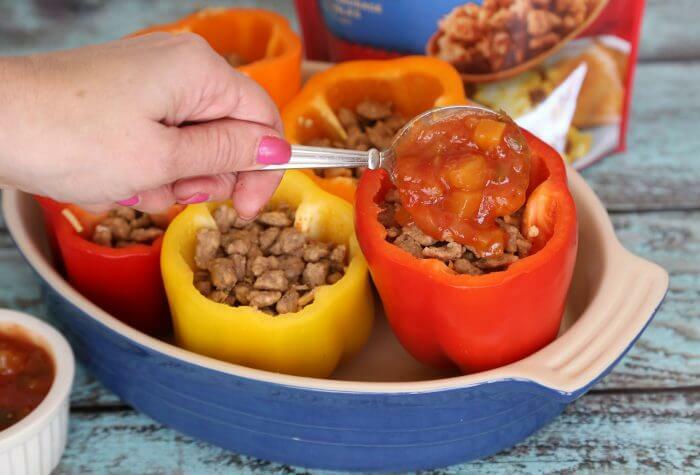 Now add in the Jimmy Dean Sausage crumbles….. and pretend you cooked for hours..
Add another layer of salsa and then fill your dish up 50% of the way with water. This will help keep the peppers tender. I put in a tablespoon of olive oil into the water. Bake for 20 minutes and then bake the cheese until it is melted. It is hard to imagine these tasty ingredients created this gourmet meal in minutes. Preheat the oven to 400 degrees. Lightly coat the peppers with olive oil and pour in some water into the pan to keep them moist then roast in a baking dish about 20-25 minutes just until cooked thru. Remove the peppers from the oven and allow to cool until you can handle them. If you chose to freeze them do so before cooking, then you will then need to do the above instructions, but you will have to cook them for an additional 10 minutes. This is how you make stuffed peppers in the Pressure Cooker. 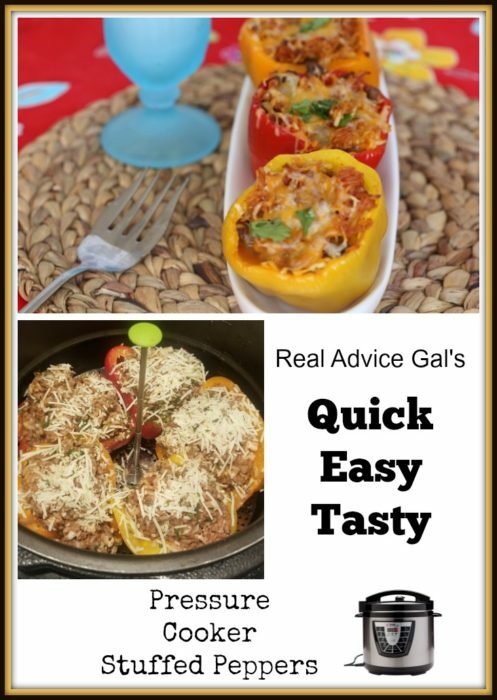 *** Use your stuffed pepper recipe and follow these cooking instructions. Place 1 cup of water in the bottom of your pressure cooker make sure that your pan is in there. I know a lot of people forget that part and ruin their unit. Then place a steamer or ramekins in the pressure cooker. You will then place your stuff peppers in the Pressure cooker. If your pepper is stuffed with precooked meat, then you will cook them for just 5 minutes. If your stuffed pepper has uncooked hamburger meat in it, then you will need to cook your peppers for 15 minutes with a 10-minute natural release. 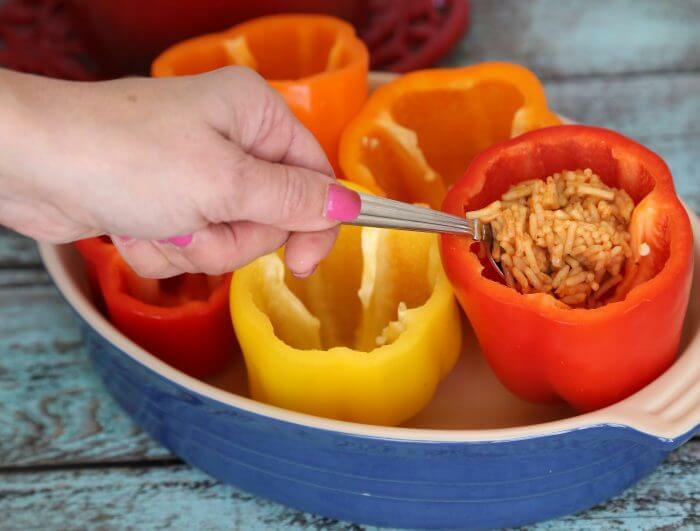 Natural release means to open the vent and let your stuffed peppers sit in the pot. I found that the ramekins help the peppers keep their shape. These are a couple of my must-have accessories for your pressure cooker. Shaking Up Breakfast With Jimmy Dean® and State Fair®!